It’s best to start at $1.50 a slice. That is what pizza was selling for about a year ago at a family business that is a combination vegetarian Indian restaurant, candy store and pizza parlor on Avenue of the Americas (also known as Sixth Avenue), between 37th and 38th Streets. 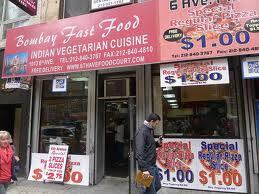 It is called Bombay Fast Food/6 Ave. Pizza. Then a Joey Pepperoni’s Pizza opened near the corner of 39th and Avenue of the Americas, offering pizza for $1, a price that has in recent years been favored by a number of New York pizza establishments. So Bombay/6 Ave. Pizza shrank its price to $1 too. All was good until last October, when a third player entered the drama. 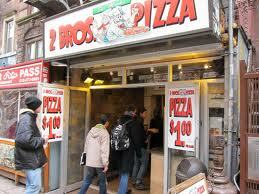 A 2 Bros. Pizza, part of an enlarging New York chain of 11 shops that sell slices for a dollar, opened virtually next door to Bombay/6 Ave. Pizza. The only separation is a stairwell that leads up to a barbershop and hair salon. Price stability at a buck all around persisted until eight days ago, when both 2 Bros. and Bombay/6 Ave. Pizza began selling pizza for the eye-catching price of 75 cents a slice, tax included — three slender quarters. For his part, Eli Halali made it clear that 75 cents was a temporary price point. He said he could not make money at that level and eventually would return to $1. He said that if Bombay/6 Ave. Pizza went back to $1, he would as well. If it didn’t, he said, it better watch out. The brothers said they are also contemplating adding fried chicken to the Avenue of the Americas store to intensify the pressure on Bombay/6 Ave. Pizza. Differentiation may protect them. Yelp reviewers love the Indian items at Bombay Fast Food. The Halalis should introduce some Middle Eastern items. And perhaps Bombay Fast Food should just get out of the pizza business. This will allow pizza prices to go up. Then, pizza sales will stop cannibalizing profits from the Indian food operation. I am still laughing at the multi-business angle that I have seen on a couple of other occasions in NYC. These small business leaders seem to situate several businesses at one central location in order to avoid the high real estate costs in NYC. I once saw a small office that centrally located three offices: one for a computer repair shop, a moving company, and a van rental business. Same owners, managers, and office. In this example, differentiation is key. Bombay Fast Food may be able to attract more customers–even at a higher price–if they Indian-spice the pizza or add topping options that are largely unavailable at other pizzerias in NYC. For instance, put a hot dog on a pizza. That way, they can add “hot dog vendor” to the mix!